More than being a role, motherhood is a calling, the tasks of which can be extremely exacting sometimes. In light of this, new mothers need all the words of encouragement they can get, to prepare them for the tasks ahead. 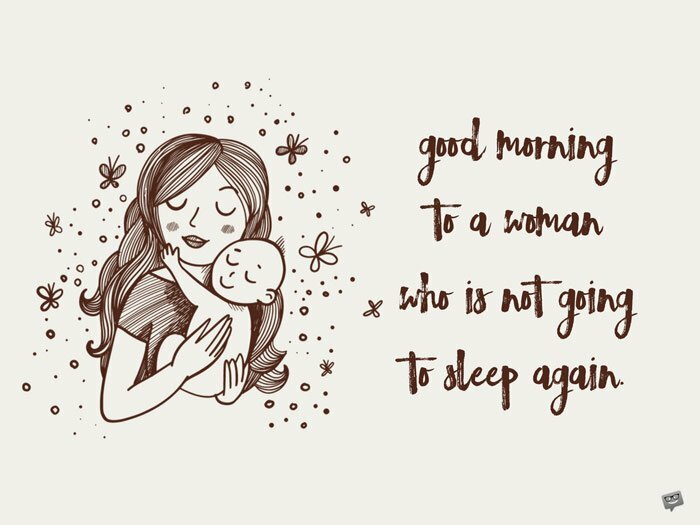 Here are a few morning messages to inspire you to pen a heartwarming note to a new mother you know. Good morning, sweetie! Sending the heartiest of congratulations to you on the latest addition to your absolutely lovely family. Your baby is lucky to have an amazing woman like you as his/her mother. I remain proud of your fortitude and strength over the past nine months. Now that our little prince is here, I know that he will find a terrific mom in you. Good morning! Congratulations on giving us a pretty little princess! May you receive divine wisdom, knowledge, protection, and understanding to coach her well. Good morning! Finally, the long wait is over. I’m so happy for you that you’ll experience the joy and fulfillment that comes with motherhood. Good morning, and have yourself a truly blissful life. Good morning! I wanted to remind you to engage in the play, tale telling, and cuddling now because they grow up so fast. I’m so proud of you. Congratulations. Your first job has become a mere avocation; work is now all about showing solicitude, affection, and unconditional love to this handsome little boy. Good morning, and congratulations. I encourage you to savor every bit of motherhood — both the challenging and enjoyable because you’ve earned it. Good morning and congratulations, my friend. The journey of motherhood is marked by ups and downs. For the sake of this cutie, I exhort you to stay the course. 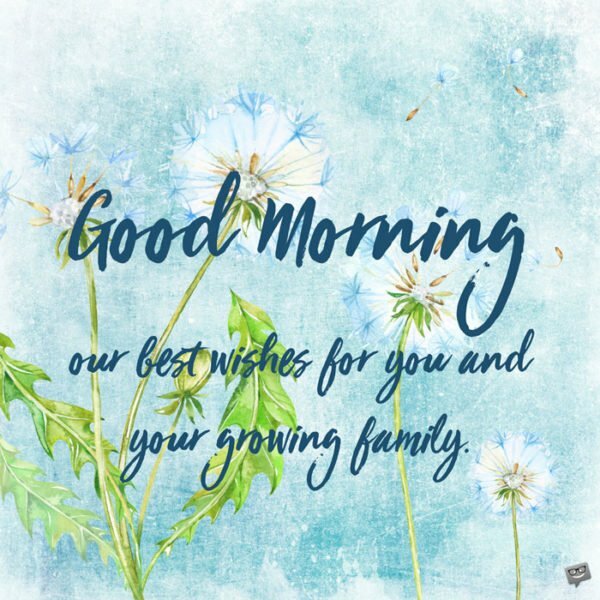 Congratulations, and have yourself a beautiful morning! Good morning, honey! I wanted to thank you for making me a proud father. You just took my joy to extraordinary levels. For this, I remain most grateful. Real mothers are forbearing, thoughtful, compassionate, and firm. May you live beyond these expectations. Good morning, and congratulations on finally joining the beautiful mothers of this world. Good morning to the newest mother in our family! Thank you so much for expanding our family with comely twins. Do not hesitate to reach out if you need anything. Congratulations. As the newest grandmother on the block, I promise to share all the tips and secrets for raising amazing kids that I know. Good morning, congratulations, and thank you so much for making me proud. Cheers. Birthing a baby is a sublime experience; none but you can understand how it truly feels. I’m sure that you will have a great time teaching our little one the ropes of life. Good morning, and congratulations. I have no doubt in my mind that this little angel you have brought into this world will become confident, brave, and intelligent like her mom. After all, such good traits can rub off another easily. Good morning, and congratulations on gifting us with such a beautiful angel. I can’t wait to hear all about the cuddles, bedtime stories, and sweet baby sounds. They really infuse motherhood with life and smiles. Good morning and congratulations to you, my dear. The first baby is and will always be the first love, first companion, and first soft spot. I urge you to savor every bit of it. Congratulations and good morning, my sister! Good morning and congratulations, sweetie! Thank you for proving me right when I said you have what it takes to be a mother. I look forward to having many more little angels with you, my love. I look forward to raising my son along yours! Together, we can make a power team. Hearty congratulations, my friend! Good morning. At long last, our handsome little prince is here with this! May the womb that bore him be strong, happy, and content forever. Good morning and congratulations, dear. Good Morning. Our best wishes for you and your growing family. You have overcome months of pain, discomfort, and illness to bear a wonderful son. I pray that you will find an even stronger endurance to raise him to a responsible adult. Good morning, my little sister. I imagine that you are overcome by an overwhelming sense of accomplishment at this time. The entire family and I were very happy to hear the news of your baby. Good morning and congratulations! Good morning, and welcome to the mother’s club! As a newly minted mother, you are allowed to kiss and cuddle your baby at any time of the day. Here’s to enjoying and living the moment. Cheers! When I first had my kid, all I wanted to do was cuddle with her all day. I imagine you have a similar feeling at this time. Make sure to enjoy her. Good morning, and congratulations. Good Morning to the woman who brought new life into the world. I’m sure you woke up to the dulcet cry of your baby today. How sweet that must have been! Hearty congratulations to you, my dear. Good morning! Today, you’ve begun a journey that requires tenacity, patience, and resolve. I couldn’t be more proud to call you my daughter. Good morning, and congratulations on the cute baby. Being a first-time mother can be both challenging and rewarding. Now it behooves on you to stick with it and give it your best shot. I’m confident in your abilities. Good morning, and congratulations on the new baby. 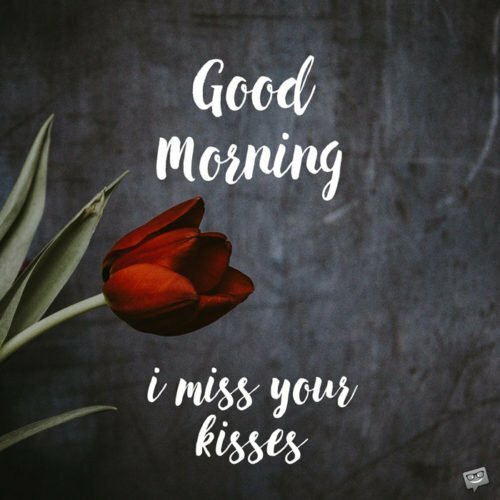 Good morning, dear. The joy of every new mother is hearing the laughter of her new baby. I’m sure you will have your fare share of it today. Sending you loads of hearty congratulations once again. Good morning to a woman who is not going to sleep again. Babies are a constant reminder to take time and savor the things that matter in this life. I hope you will spend some quality time with the little one. 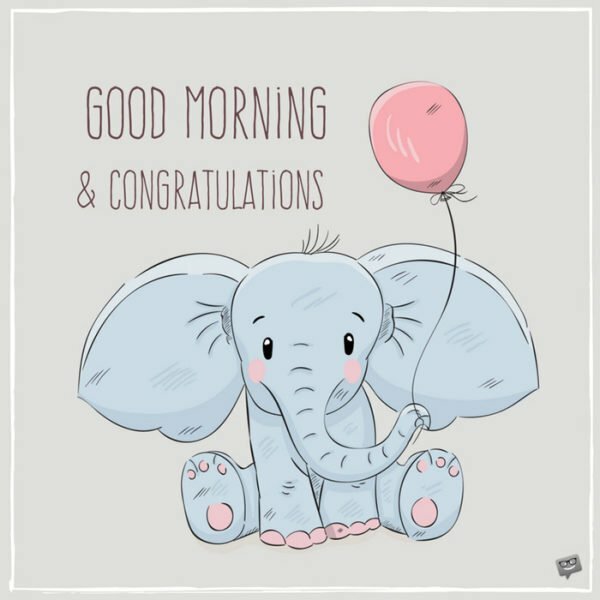 Good morning, and very big congratulations to you! I’ve always wondered what it feels like to be a first-time mother. We should make time so that you can tell me all about it. Please know that the family and I are so happy for you. Good morning. Here’s to more laughter, fun, and learning with this charming princess. I can’t wait to see her face to face! Good morning, and congratulations.